This article was originally published by Business Day (South Africa). All views are the author’s own and not attributable to SHLC. 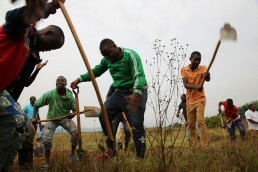 Rwanda’s clean streets and tidy pavements have attracted the attention of President Cyril Ramaphosa, finance minister Tito Mboweni and Johannesburg mayor Herman Mashaba — and for good reason. Its litter-free city centres, suburbs and informal settlements are the exception across much of Africa, winning plaudits from around the world. Yet on a recent study visit to the country it soon became clear to me that the lessons for South Africa go beyond external appearances and a certain fetish for cleanliness. Widespread participation in regular civic campaigns is the first important message. Once a month, every adult is expected to contribute to communal projects, from repairing roads to clearing choked ditches and maintaining public facilities. Everyone from top politicians and senior officials to ordinary citizens dons their overalls and pitches in. Umuganda, Nduba Sector, Gasabo District, Rwanda. Credit: Ministry of Environment - Rwanda. President Paul Kagame has built on a long tradition of umugandato forge a sense of national cohesion through community service. Umuganda literally means people coming together for a common purpose. The idea is to foster a spirit of collective responsibility and civic pride by working hand-in-hand on practical local schemes. The initiative stems from the 1994 genocide, when nearly 1-million Rwandans were wiped out over a three-month period. During that disastrous episode, leaders exhorted ethnic Hutus to do umuganda and kill minority Tutsis and Hutu sympathisers. Repurposing the concept is helping to undo the legacy of social division and motivate citizens to get involved in collective actions that promote trust and belonging. These neighbourhood programmes are supported by other measures to increase safety and hygiene in public spaces, such as a ban on single-use plastics and fines for infringing municipal bylaws. Street traders are encouraged to operate from serviced premises and there are restrictions on disruptive kerbside activities. "Rwanda’s view of the city as a platform for progress is inspiring. Determined leadership at local and national levels is championing an urban agenda that builds commitment to a more prosperous future and fosters civic involvement in the process." Interestingly, there is another even more significant feature of the drive to make Rwandan cities more liveable and integrated. The effort signals a strong vision of the country’s future path to development. Kagame’s government has embraced urbanisation as a vehicle to speed up Rwanda’s transformation from an impoverished rural society to a prosperous modern economy. Encouraging people to move from the countryside to the cities makes it easier to provide decent jobs, hospitals, training colleges and other public services. The emphasis on tidiness and order symbolises a concerted agenda of urban reconstruction. Major investment in quality roads and other infrastructure is laying the foundations for well-functioning cities. Leaders know from experience elsewhere that carefully managed urbanisation can spur productive activity and generate income, whereas haphazard urban growth is a recipe for congestion, contagion and serious environmental problems. 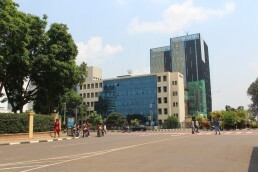 Kigali’s central business district is being reconfigured to support office development, business services and technology-based enterprises. Hotels and shopping centres are expanding to accommodate tourism, leisure and commercial activities. Large industrial estates are being built on the outskirts to attract inward investment and enable firms that currently occupy overcrowded inner city sites to grow. Upgrading informal settlements is also part of this agenda. Installing water and sanitation networks, storm-water drains and local access roads will enhance the quality of life for low-income communities. Better schools and clinics are other neighbourhood priorities. One can’t help but be impressed by the scale of investment and upkeep of public amenities. To plan and manage rapid urban development, capacitated city governments are being established, led by highly competent officials and energetic young mayors. Meanwhile, the banks have been encouraged to expand the provision of mortgages to accelerate house-building. The state social security fund has also made substantial investments in housing and other property development. One’s enthusiasm for Rwanda’s approach is tempered by certain reservations. A tendency for top-down decision-making can undermine human rights. Several informal settlements have been relocated to the urban periphery without consulting or compensating the residents. Street vendors, beggars and homeless people are also periodically rounded up for “rehabilitation”. Sometimes the modernising zeal is also overdone. At one point, thatched roofs were declared obsolete and people were obliged to replace them with corrugated iron, despite its inferior insulation properties. The housing boom has also focused on the upper end of the income spectrum, raising concerns about a potential property bubble. Nevertheless, Rwanda’s view of the city as a platform for progress is inspiring. Determined leadership at local and national levels is championing an urban agenda that builds commitment to a more prosperous future and fosters civic involvement in the process. • Prof Ivan Turok is Executive Director at the Human Sciences Research Council. He is Co-Investigator at SHLC and leads the research team in Cape Town.